October 14, 2010 - The Federal Aviation Administration (FAA) is proposing a $664,000 civil penalty against William C. Dause, doing business as The Parachute Center of Acampo, California, for allegedly failing to perform required aircraft parts replacements and failing to comply with safety directives. ?Putting parachutists at risk by neglecting to follow safety procedures is unacceptable,? said U.S. Transportation Secretary LaHood. ?We expect aircraft operators to comply with our safety rules and will take enforcement action when they do not.? The FAA alleges that The Parachute Center operated a DeHavilland DHC-6 Twin Otter when critical parts were well past their life limits and without inspecting portions of the wings for corrosion. In all, the FAA alleges that The Parachute Center operated the aircraft on approximately 2,121 flights between March 21, 2008 and Nov. 4, 2009 with elevator control cables that were overdue for replacement and when the plane was not in compliance with Airworthiness Directives requiring visual inspections of the wing main spar, lower spar cap extensions and wing support strut for possible corrosion. The FAA also alleges that the company operated the aircraft on at least 500 flights between April 16, 2009 and Nov. 4, 2009 with aileron control cables that were overdue for replacement. ?Passengers and crew have to be able to trust that an operator has done the right thing and has complied with all the rules,? said FAA Administrator Randy Babbitt. ?Safety and compliance are the right choices, every time.? The Parachute Center has 30 days from receipt of the FAA?s enforcement letter to respond to the agency. The Parachute Center website reports that the company has been in operation since 1964, and that it is one of the largest and oldest parachute training companies in the United States and instructors are licensed by the United States Parachute Association (USPA). 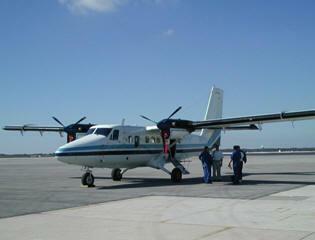 The company reports that their aircraft fleet consists of a Beech 99, King Air 200 and 2-Super Otters.